Faith necessarily and in the first instance involves the intellect. Certain facts must be known and believed to be true. ‘True Faith in the Scriptures is not merely a firm assent [assensus] to the way of God, which is prescribed by Christ; this is the Historical and dogmatic faith of the Papists; but more than an assent [assensus] of the mind, true faith is determined by the heart’s trusting [fiduciam] in God through the Mediator, and by a fiducial [fiducialis] leaning upon him. 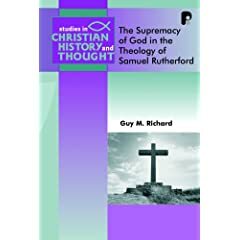 Rutherford, therefore, believes that every minister should preach in such a way as to appeal to and excite all the faculties of the soul, but especially the affections. A sermon that concentrates only on the presentation of information to the mind fails to excite the affections and, thus, leaves its hearers no better off in their pursuit of sanctification. Truth must be crafted and presented in such a way so as to encourage love in the affections for Christ. Amen to that Mr Rutherford! …the voluntas signi, which is the ‘revealed’ (revelata), ‘approving’ (approbans), or ‘commanding’ (preacipiens) will of God, whereby he makes known to his creatures all that he approves of, as being ‘morally lawful and noble, even if the future actuality of … [those] good thing[s] may never by decreed by God.’ In this way God desires, approves, and commands many things to be done, which he decrees not to be done in actuality … For example Rutherford says that God ‘desires the obedience of Judas and Herod and Pilate‘, by his approving, commanding and revealed will, and ‘yet he decreed [by his hidden or decretive will] that they should crucify the Lord of Glory‘. PS Much more to come from this book – it really is top notch. To say the truth, I acknowledge that I am astonished, and greatly at a loss, when I hear learned men, and professors of theology, talking presumptuously about the order of the Divine decrees, and when I read such things in their works. Now judging by the secondary literature Leighton was a good “Calvinist” – despite his conformity – but I’m not posting this to discuss the theological merit of his statement. What struck me was that we have here an eminent and respected theologian expressing amazement at how bold some leading Reformed thinkers have been when speaking of the order of the Divine decrees. If Leighton was astonished at leading Reformed theologians discussing these matters what would he make of today’s reformed blogs and discussion boards where dogmatic pronouncements about the various lapsarian positions are routinely made? Indeed, perhaps this is the greatest danger of blogs/internet discussions – everyone has a platform from which to opine on areas where even the most qualifed theologians must tread with care.